This section describes what is the MetaMask stat logs and how to download and read it. If you want learn more about how MetaMask works, you can download the state logs and read it. MetaMask state logs contain your public account addresses and sent transaction history. 1. On the MetaMask wallet, Select "Settings" from the menu at the top right corner. 2. Click "Download State Logs" and save the file to \herong\MetaMask State Logs.json. 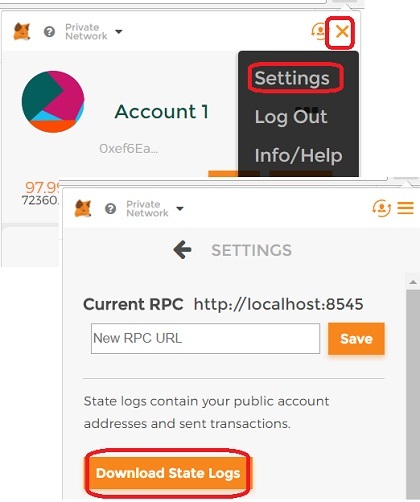 The primary RPC target is: https://rawtestrpc.metamask.io/. My account address is 0xef6ea9f8bd78ac42fb2617ba90846d5785bb320c. There is no unapproved transactions at this moment. MetaMaks is currently connected to "http://localhost:8545". The netwok ID is 314. My account on this network has a balance of 0xef6ea9f8bd78ac42fb2617ba90846d5785bb320c, which binary form of 97.999979 ETH. I had a confirmed outgoing transaction for network 314. The transaction was sent from 0xef6ea9f8bd78ac42fb2617ba90846d5785bb320c to 0x485410d2e7b8bfb6f78e5e5acf7d1057cb853fce. The transaction amount was 0x1bc16d674ec80000, which is the binary form of 2 ETH. "note": "txStateManager: setting status to submitted"
"note": "txStateManager: setting status to confirmed"
MetaMask start with a draft of the transaction object. Then it started to replace or add properties of the transaction object. Then it signed the transaction and followed up on the status. So MetaMask state logs records all the details of each transactions you sent out from the MetaMask wallet.